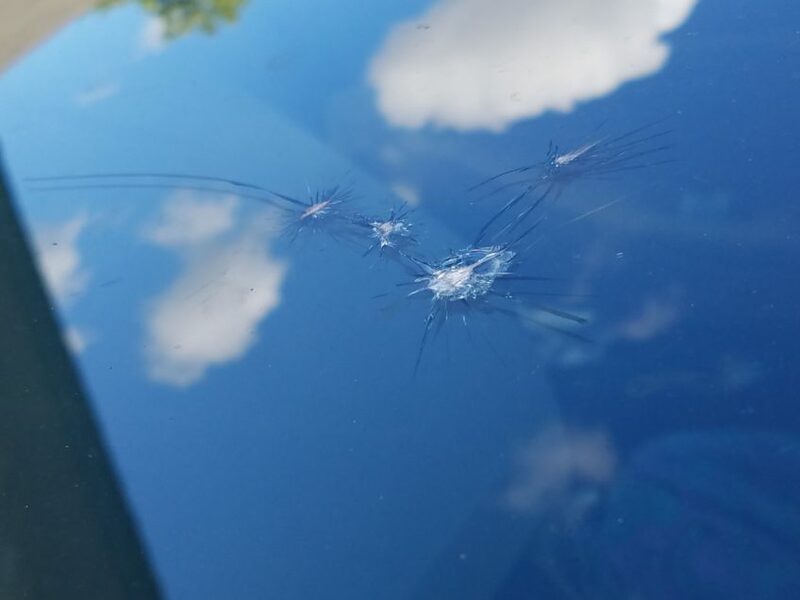 Home / The Mobile Glass Blog / Can My Windshield Be Repaired or Will It Have to Be Replaced? The first thing that we consider when determining if a vehicle requires a windshield replacement or chip repair is how extensive the damage is. Typically, we say that if the chip or crack in the glass is smaller than the size of a quarter, it can be repaired. Cracks that are substantial such as three inches or longer can create a greater challenge for repair, but in some cases can be fixed. This is a windshield that is normally considered beyond repair, however the customer didn’t have time to wait for replacement and requested repair initially. We explained the repair would only be a temporary fix and he was comfortable with that. Extreme windshield crack which requires replacement. For cracks that are six inches or more, these are most likely what’s called “running cracks.” These are the cracks that you see getting larger day-by-day. What’s important to keep in mind is that repairing a cracked windshield requires pressure to be put on the glass. As soon as an attempt is made to repair an extensive crack, there is a high risk that the crack will quickly spread across the entire windshield. Something else that has to be considered is if the windshield has been worked on in the past and the repair was not performed properly. If this is the case, it may no longer be repaired and will require a windshield replacement. Having a crack repaired as quickly as possible is recommended. The longer the crack is exposed to the environment, the more difficult it becomes to repair it. The reason why it becomes more difficult is because dirt, debris and moisture accumulate within the crack or chip. When the resin used for the repair is injected, it mixes with the foreign matter and creates a discolored finish to the crack, instead of being clear. As a result, the drivers vision is obstructed which is unsafe. The size, how recent the crack occurred, and whether it has been previously worked on before are indicators used to determine if a proper windshield repair can be performed. The process for a windshield repair requires the use of a precision drill, similar to the size of a dental drill. This tool is used to drill a path where the resin can flow into the damaged area. We then use an injector to insert the glue under pressure so it can spread through and fill all of the compromised glass. The next step includes the application of a UV light to harden the resin. After this step is completed, there will be no air present between the glass that was separated by the crack as the resin bonds it together. Furthermore, there is no concern for reflection. Once the repair is completed you are good to go and there are no restrictions. Here’s a good video we made for mobile windshield chip repair on YouTube. 3 incdh long cracxk on pasanger side of windshield. I think, for us, that would be a replacement. I’d love to see a picture if you have one. That would really help with determining if it can be repaired. Thanks! Do you do auto window tinting? We are looking for a quote for our new car – front driver/passenger windows only. The back windows are currently tinted.